Last week my partner and I decided to take a break from the beaches of Playa del Carmen, and have an adventure in the Mexican jungle. Aktun Chen Natural Park, otherwise known as ‘Indiana Joe’s’, seemed the perfect place to start, located an hour south of town. Our van veered off the highway and took us 3 KM into the jungle, before depositing us at the entrance of the park. We signed in and met our guides for the first part of the tour – zip-lining! It was our first attempt at this adrenaline-inducing activity, so I was a little nervous, but the professionalism and friendliness of the guides who ran through our safety briefing immediately put my mind at ease and allowed me to focus on one thing – having fun! Zip-lining over the canopy of trees was an absolute blast and was not even a little scary, just exhilarating! When the time came, I even went upside down, as the guides showed us how to do, letting my arms hang over my head as I flew along the line. Soon, it was time to return to earth, and explore an ancient cave system. We followed our guide into the depths of an enormous limestone cave, decorated with an impressive array of stalactites and stalagmites. It was eerily beautiful, wandering through the bizarre landscape formed by millions of years of geological processes. Fossils of shells and sea creatures were visible in the limestone, reminders that the cave was once the sea floor. It is now home to an impressive cenote, or fresh water pool, which is not open for swimming in order to preserve its natural beauty. Lit from above, the light shone straight through the crystal clear water, creating an ‘other worldly’ atmosphere, like a scene from the movie Avatar. Afterwards, we enjoyed a delicious lunch of quesadillas and fajitas, entertained by colorful parrots in the trees outside. The spider monkeys, however, stole the show. Tiny babies clung to protective mothers high up in the tree tops. While the older members of the family caught up on some much needed beauty sleep. 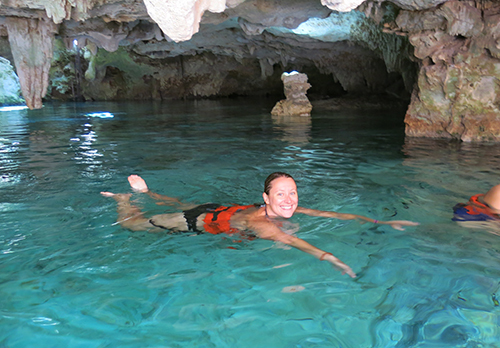 Next it was time for the part of the tour I was most looking forward to – snorkeling in the cenote! As you know, I love cenotes, so I was excited to see what ‘Indiana Joe’s’ had in stall for us. We made our way down a rocky staircase and were greeted by a beautiful limestone cave filled with crystal clear, turquoise water. It was breathtakingly beautiful. Everybody gasped as they entered the water, due to the refreshingly cool temperatures! We donned our snorkels and followed our guide around the large cavern, observing the beautiful formations below through the crystal clear water. The water was so clear, that at times it felt as though I was flying over the deep caverns and the fish who made their home there. After our guided snorkeling tour, we had some free time to swim in the cenote and explore the different pools within it. At one point, my partner and I were the only ones floating around in a small pool, with light streaming in from a narrow opening above us. It was such a peaceful and magical moment, filling me with gratitude to be experiencing this part of Mexico and its untold natural treasures. Like all good things, our jungle adventure had to come to an end. We zip-lined, saw beautiful animals, explored ancient caves and swam in their magical waters. We experienced the exhilaration of flying over the tree tops, as well as the peaceful rejuvenation of floating in fresh water pools created by Mother nature herself. Most of all, we were reminded just how special this part of Mexico is, and how much we love spending time discovering the beauty, history, culture and natural wonders of the Riviera Maya, a part of the world everybody should visit at least once in their life. Contact the concierge at Condo Hotels to book your tour to Aktun Chen Natural Park today!